Makeup is undoubtedly one of every girl’s favorite toys. As a lady, our feminine side will always knock on our doors at least sometimes if not every day. There are days when you just enjoy playing with those different shades and can’t wait to see how your smokey eyes will look like after application. It is very exciting and fulfilling when you get to put on your makeup perfectly. But there are also times when you just want to throw your makeup away because your lashes refuses to curl or your eyeliner just won’t go straight. Makeup application definitely requires practice for someone to put it on perfectly. But if putting on makeup to yourself is a challenge, how about applying it to someone else? Would it be harder? 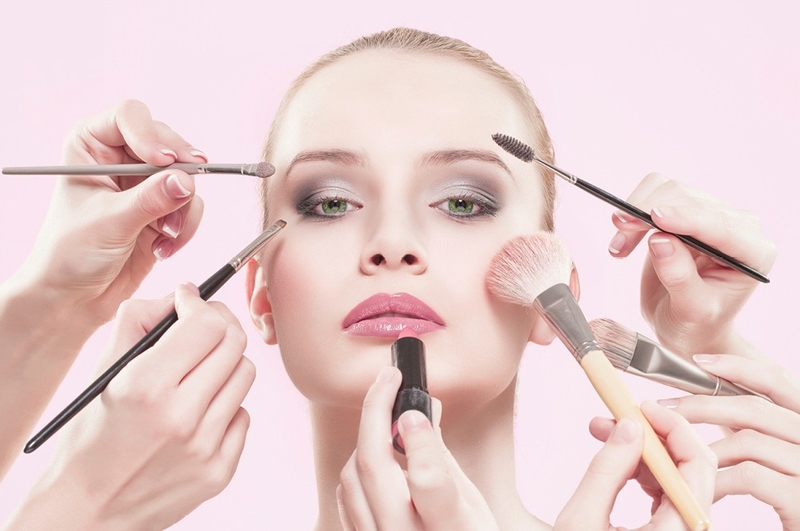 This article will teach you how to put on makeup to others. Don’t forget to wash your hands before starting and in between persons. Infections can be transmitted when working around others' eyes. Since you have to use your right hand to find the placement and your left hand for the application, it's vital to do all these with clean hands. Remove any old makeup with the use of a makeup remover or baby oil. Putting on makeup on top of old makeup will only end up with an unnatural and caked on look. Also, ask the person to wash her face with a mild cleanser. Putting on makeup with sweat and excess oil will only result in a greasy look. This can also clog the pores and cause acne and other skin problems. The skin will produce more oil to compensate for its dryness caused by cleansing. So, put some lotion or moisturizer on the face to obtain a fresh look. Sit in front of the person for you to see clearly the structure and shape of the face. Make sure that the lighting is balanced. You may use a mirror with built-in lighting. This is very important for you to make a balanced application on both sides and a perfect finish. A concealer is used to cover acne marks, red patchy areas, dark circles around the eyes and other blemishes. It is primarily used to even out the skin tone. Use a brush or your clean fingertips to dab a pea-sized amount of concealer around the face and neck. Make sure to spread it out evenly to avoid discolored parts on her face. There are different types of foundation but they are all used for the same purpose -- to even out the skin tone on top of the concealer you had applied on her face before. Apply the foundation on the entire face including the neck and earlobes if necessary. Another tip on how to do other people’s makeup is to use a foundation that has the same color as the person's natural skin color. Application of setting powder will be helpful if you use liquid foundation or if she wants a long-wearing makeup. Lining the eyebrows is optional but this is recommended for people who have thin or sparse eyebrows. Choose a pencil eyebrow which has the same color as her hair. It is advised to shape the eyebrows before putting on the liner. Remove excess hair and make sure that the shapes of the brows are appropriate to the person's facial structure and symmetry. Outline the edges of the brows and then fill the middle with color. Make short strokes perpendicular to her brows to make them look natural. You may choose from different colors of eyeshadow depending on the look that you want for the person. But the most basic method of applying eyeshadow is to apply a single color over the entire eyelid. Use an eyeshadow brush to do this, start in the center near the lash line, and then blend outwards to the skin tone near the crease. Apply a second darker shade for a more dramatic look. The main color of the eye shadow should not reach and extend beyond the eyebrows. Always make sure to blend well when using more than one shade. There are many ways to apply eyeliner. Decide the kind of look you want to achieve to help you start with. Another tip on how to do other people’s makeup is to use brown or black eyeliner as these colors give the most natural look, unless the person wants a more colorful and fancy look. Make sure to use hypoallergenic products especially if it is her first time to have her makeup done. You may also choose from liquid or pencil eyeliners. Pencil eyeliners are easier to apply while liquid liners are also good but tend to smudge sometimes. Make sure you can apply eyeliner to yourself before applying it to others. If you are comfortable in applying it to yourself, then it will be easier for you to do others’ eye makeup as well. Ask the person to close her eyes and then place the thumb and forefinger of your non-dominant hand on her cheekbone and temple. This will make your hand steadier and help the person to relax. Gently apply the eyeliner on the lid of both eyes and then the bottom lid. If you are using liquid eyeliner, give it time to set before letting the person open her eyes. It is also important to tell the person that you are now going to apply the eyeliner because some people want to see what you are doing with them. By doing this, they will stay calm and not startle once you start the application. Some persons also want to open their eyes from time to time, and that’s fine. Another tip on how to do other people’s makeup is to make an ideal shape for the lips. Apply light foundation on the entire lips to see the lip line and to remove the natural pigments of the lips. Make the lips fuller or thinner by outlining the edges with a white eyeliner pencil. Outline the lips again with a lip pencil and then start to apply lip color with a lip brush. Start from the Cupid's bow outwards, then on the lower lips inwards. Server responsed at: 04/19/2019 5:03 a.m.